Search Results for "trying on"
Young wonderful girl in casual outfit posing happily in accessory shop and exploring displays while shopping alone on vacation. Man trying on different glasses. Concept of choice, decisions and fashion. ST.PETERSBURG, RUSSIA - APRIL 4, 2015: Slow motion shot of a visitor of TechTrendsExpo trying on virtual reality glasses. Woman is touching something she sees in virtual environment. Beautiful adult blonde woman struggling to fit into old too tight pair of jeans after gaining weight while standing in front of mirror at home. Reflection of sad female trying to squeeze into pants. Frustrated adult woman trying to button tight jeans with effort while standing in front of mirror at home. Reflection in the mirror of attractive upset female struggling to fit into old tight denim. Young woman trying on shoes in shop. RAW video record. 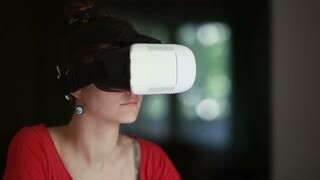 Young woman is trying on virtual reality glasses and exploring virtual environment. Redhead attractive woman chooses and trying on fashion clothes in the design show room. Pretty customer is trying on tailored shirt and sharing her opinion while clothing designer is measuring and checking garment and taking to client in light studio. 4k, Woman trying on wedding dress with her friends at a bridal store.